Home / Blog / What is a casual MMO? What is a casual MMO? MMOs have come a long way since the humble beginnings of their ancestors like Meridian59 and Ultima Online (with several others even preceding those). We have seen whole generations of development in regards of graphics, gameplay and usability. But MMOs are also bound to the time players spend in the game, this means all MMO games run in “synchronous” mode – where enough player have to be online in order to raise the gameplay experience to an enjoyable level. 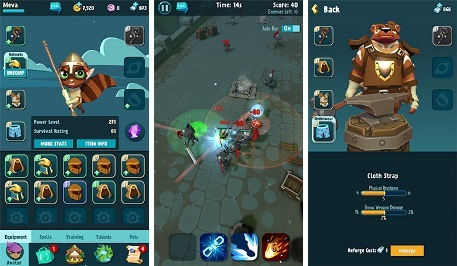 With the rise of mobile devices, more and more casual Massively Multiplayer Online games see the light of day. The usual definitions for these types of games are: Easy to learn, intuitive design, fast gameplay in short intervals and quick results. But casual games also have the “asynchronous” gameplay in common. That means players are not forced to be online at the same time in order to fully enjoy the game. In a world with many different timezones, increasing workloads and stress levels and so many different ways of life – casual games hit the nail right on the head. How do you benefit from a large player base if the major amount of players must be online in order to enjoy raids, dungeons, battlefields and guild wars together? In a casual MMO, every player has the freedom to participate whenever there is time – and is still able to enjoy, progress and contribute to the game for the full gameplay experience. So, casual MMOs feature all the typical keypoints we know and love about traditional MMO games. This includes character generation, character development, acquiring, collecting and upgrading items, finishing quests and progressing through the story and the overall game. But casual MMOs cut out the fat (like having to stay online for 3 or 4 hour shifts in order to participate in a dungeon raid) and streamline the gameplay to the most enjoyable parts. Of course this also cuts out some of the meat we used to enjoy in past (offline) games like Final Fantasy and others. But after walking from Location A to Location B for the third time, the excitement of this process like begins to fade away and is something we are more than willing to resign. I don’t say this removes repetition from the game, as most casual MMOs rely strongly on reptitive behavior (“grind”) like fulfilling daily quests, completing daily challenges or fighting the same bunch of monsters/enemies on a daily base. This kind of grind is very common to almost all casual MMO games and increases repetition, while on the other side many repititive factors are simply removed. This phenomenon goes hand in hand with “content stretching” as most casual MMOs try to deliver the same content (map, stage, level etc.) over and over again to the player (with varying degrees of difficulties and rewards). This is done in order to spread the existing, prefabricated content (that is always expensive to produce) out like butter. But also to slow down player progress as much as possible with the ultimate goal to make the player stick as long to the game as possible. In a single player game, you usually finish the main storyline in something between 25 and 50 hours – a MMO on the other hand must be able to keep it’s players around for month’s, if not years! This all being said, the casual side of MMOs is not bad at all. Okay, lets put aside some of the more P2W aspects some of them try to sell to the players as features. But besides these capitalistic developments, casual MMOs are quite enjoyable for a very long time and are able to maintain large player bases. But on the other hand, this type of MMOs is also not as innovative as many developers/publishers want them to be, its just another variation of the genre, wrapped up in shiny new clothes and then sold to the masses. If you look for a revolution in the MMO genre, better look elsewhere. But if you are looking for an enjoyable Massively Multiplayer Online experience that does not force you to lengthy game sessions every day – “casual” is the way to go! Previous post: What is a Gacha Mechanic? Next post: What is a Social RPG?